The special section will have curated content from across sources - LIVE News TV channels, short news bulletins, collection of top interviews and expert analysis, all on a single screen. What’s more there is also is a special ‘Election’ tab on the Airtel TV home screen more quick one touch access to the section. In line with its endeavor to also bring regionally relevant content to smartphone users, Airtel TV app’s ‘Election 2019’ section will have state wise election updates in eight regional languages -Tamil, Telegu, Kannada, Malayalam, Marathi, Bengali, Gujarati and Oriya, besides English and Hindi. 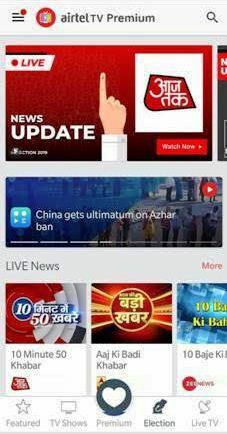 Airtel TV app users will also have access to exclusive election news bulletins from Editorji. This will include Daily Election capsules - "Election Express with Vikram" hosted by renowned journalist Vikram Chandra.